Welcome the season of kabocha! Various types are delivered, but those named “kurigatsuku kabocha” are the most popular. The reason is because they have a sweetness like chestnuts (kuri). 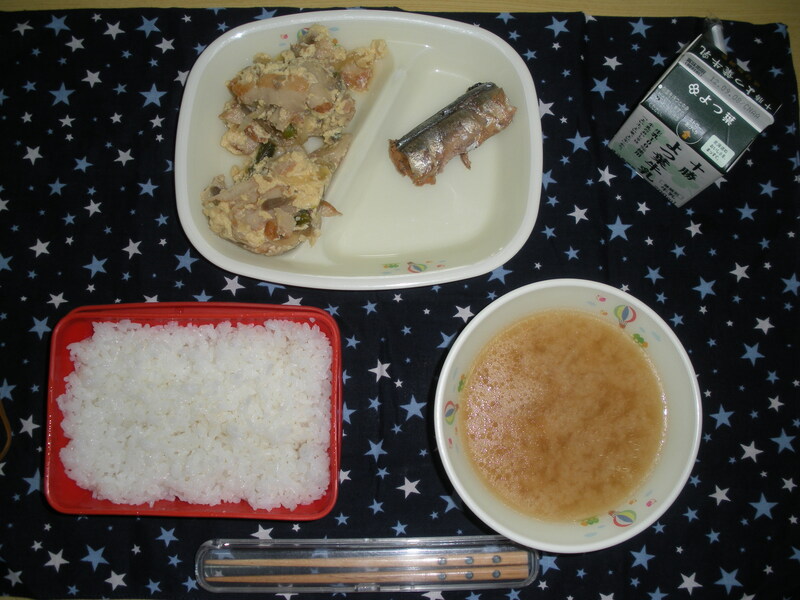 Today’s lunch was very tasty! I love squash dumpling soup. It has soft delicious dumplings along with the delightful texture and colour of burdock and daikon in a shoyu-sake based broth. Light, but very filling. Likewise the glass noodle salad has a tangy vinegar dressing and is full of crispy cucumbers and bamboo shoots. Upon reading the menu, I was unsure if I would like the baked perilla chicken, but it had a nostalgic chicken nugget taste that reminded me of an imagined childhood. 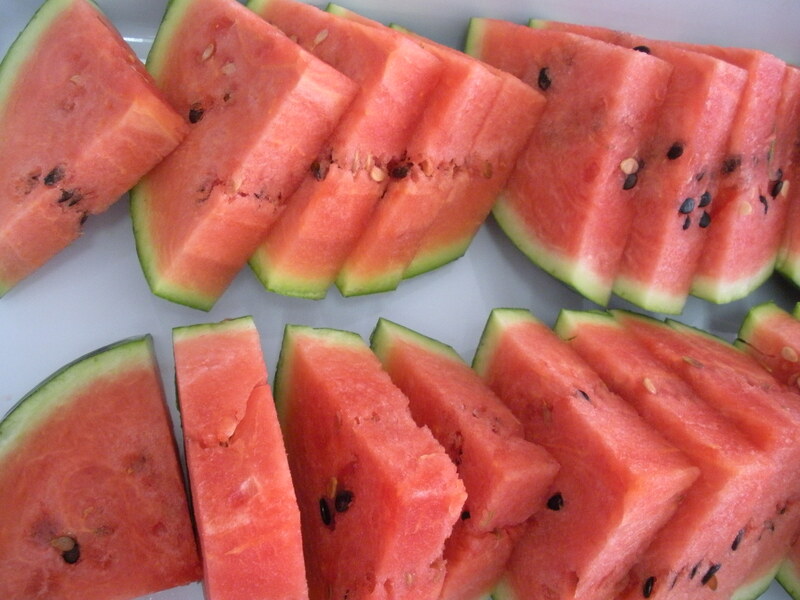 Although it was not served as a part of the school lunch, we had watermelon for dessert. My town is a farming community at heart, so one of the parents gave watermelon from their farm for everyone to eat. The habit of giving extra produce to friends is quite common here. This week alone, I’ve also received four ears of corn and two carrots (cf. 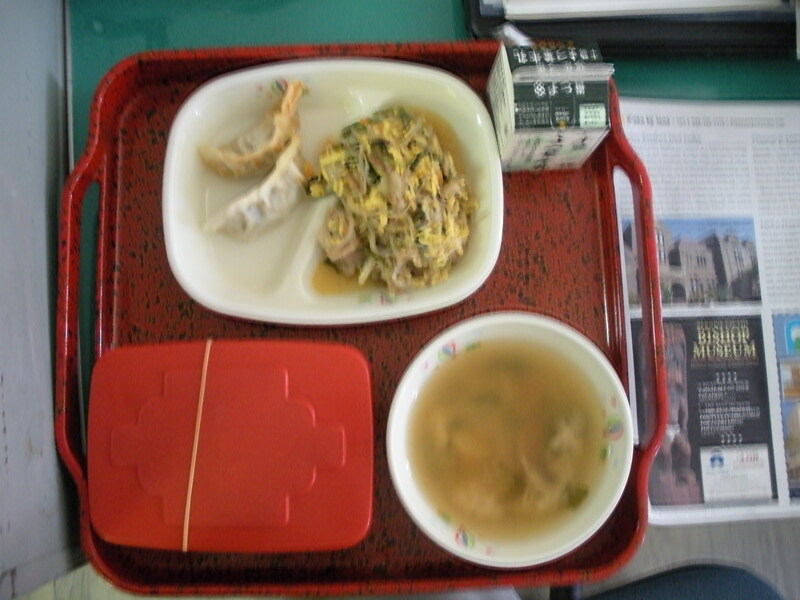 yesterday’s lunch). If a person receives more produce than they can consume, they will pass it on to other friends. It makes for a really warm community. The meaning of the oft requested gâteau au chocolat is “chocolate cake”. 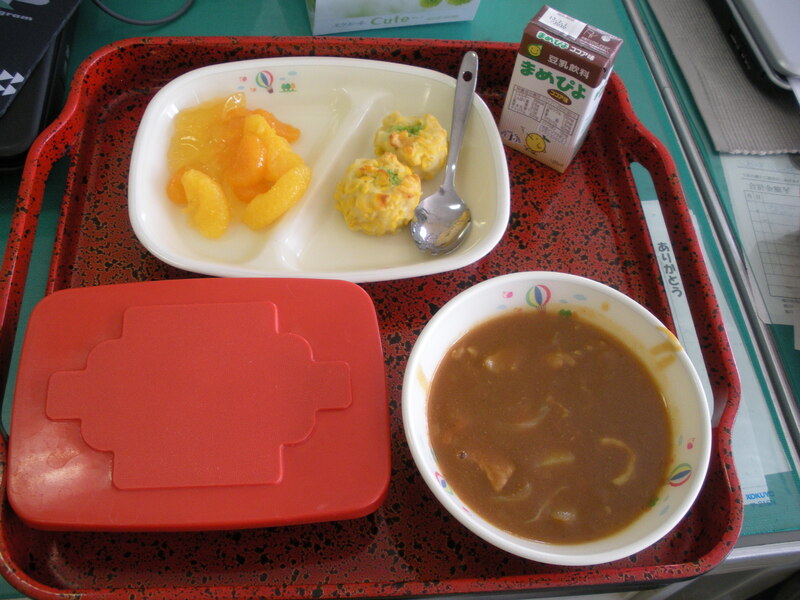 Having sweets appear in school lunch all the time is not good, from the point of veiw of studying food. 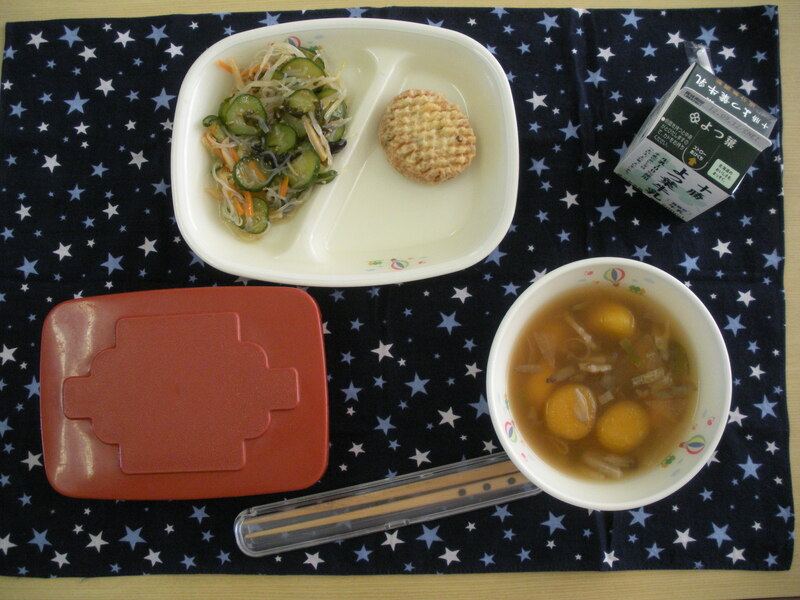 The students had testing all day, so I ate lunch at home today. 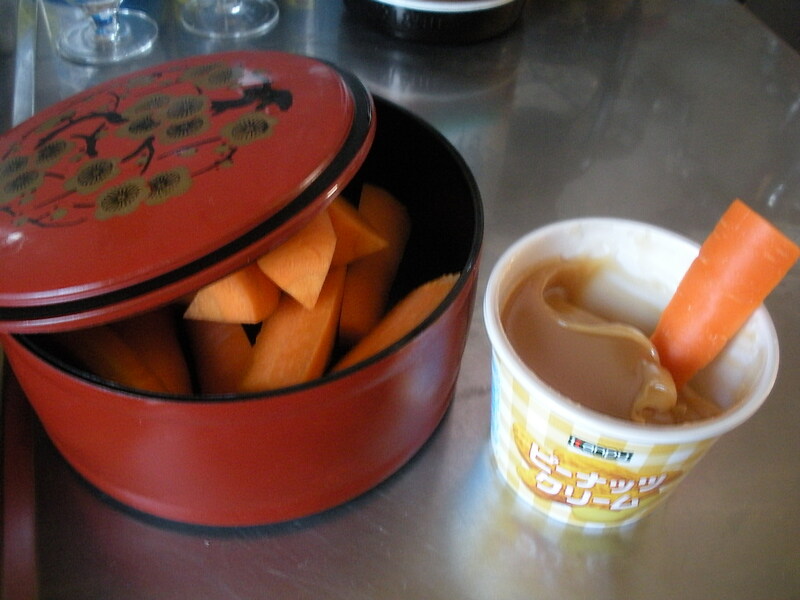 As you can see from my picture above, my lunch consisted carrots dipped in peanut cream, supplemented by a corn-cottage cheese salad and sekihan left over from the Shrine Festival last weekend. Now peanut cream is much maligned by foreigners in Japan, and I think it is rather unjust. It seems to me most foreigners first experience with peanut cream is the mistaken assumption that it is peanut butter. It’s not all, but to be fair it is sold in the jam aisle. Peanut cream, thankfully contrary to its name, is made mostly of mizuame and crushed peanuts. It contains no dairy, and in fact has much less fat than peanut butter does. Anyway, when said foreigner discovers peanut cream is nothing alike peanut butter, he feels much wounded and thus forms a permanently negative opinion of it. Peanut cream may not be an ideal substitute for peanut butter, but is serves as a delightful variation on caramel sauce. In fact, a more accurately descriptive name of the product would be “peanut caramel”. When asked about the cultivation of Furano onions, it appears they do not lack for watering through sprinklers. 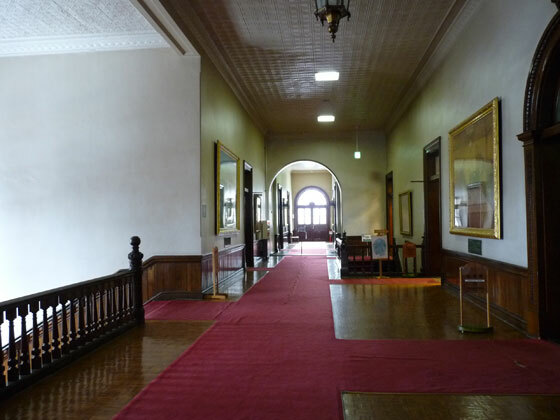 The raising of onions is connected to the weather of the Furano basin. 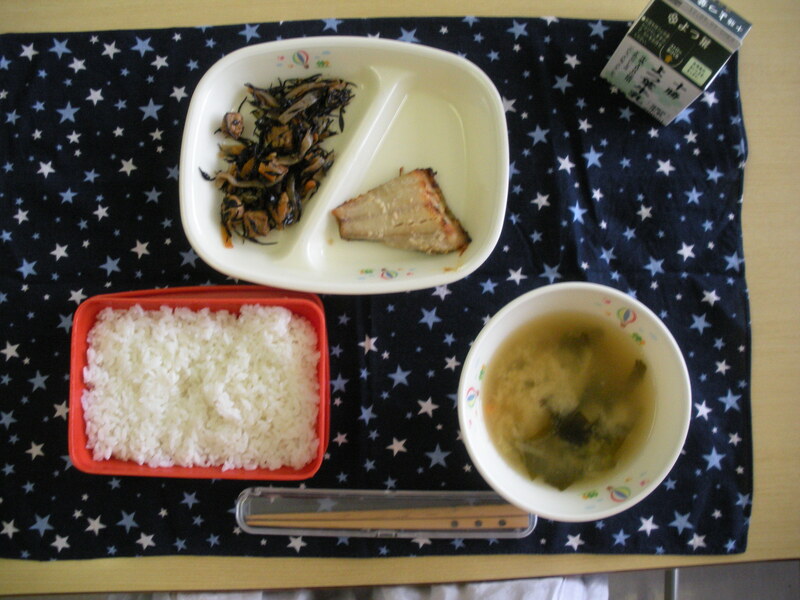 Tuesday is “foreign foods” day, so all the dishes are in a foreign (usually western) style, like today often written all in katakana, the script often used to indicate a word of foreign origin (cf. below). Brown stew I am familiar with and pork patty (lit. 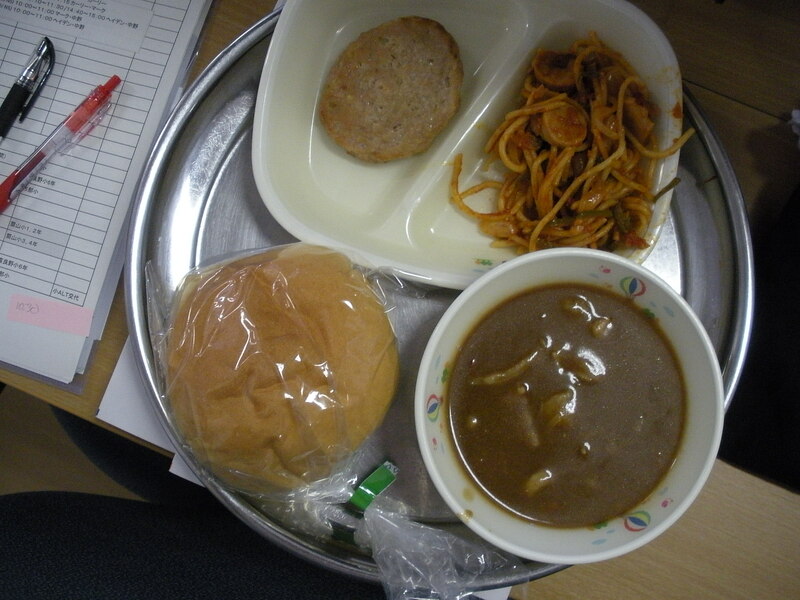 pork hamburg) was a staple in the school lunches of my youth. Spaghetti Napolitan I assumed was some sort of Italian\European dish but upon looking it up, I was wrong. Instead, Spaghetti Napolitan seems to be American. Namely, it is a Nipponized version of military rations circa Occupied Japan. Thinking more about it, this makes sense. Spaghetti Napolitan tastes rather like military rations circa WWII. Yum, Yum? Speaking of military rations, when I was child I lived for a short time in a refugee camp. We ate military rations everyday. For breakfast and dinner they set up portable stoves inside a tent and cooked these giant tins of food. The one I recall the most was a sort of egg and meat casserole, but I also remember applesauce. I am a fan of applesauce. Everyone would line up with plates and then soldiers would dish out what we wanted. The bad part was we then had to walk to the eating tent. The eating tent was only short distance away but there was a constant wind blowing up dust which quickly coated all the food on your plate. As a kid I didn’t mind so much, but I think it was difficult for some of the adults. 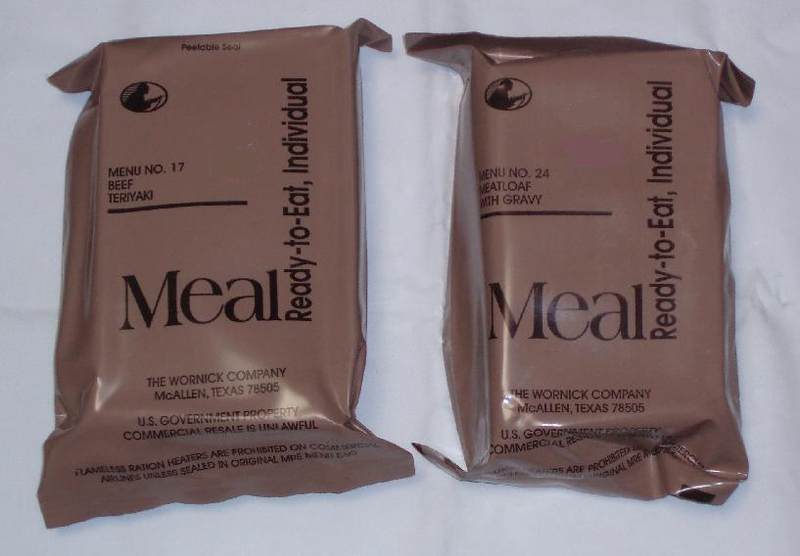 For lunch we had MREs, that is Meals-Ready-to-Eat. My favourite was the pound cake. One soldier kindly shared the recipe that if you mix the cheese spread with the cherry juice mix and put it on the pound cake, it tastes like cherry cheese cake. I never managed to refrain from devour the separate ingredients before collecting them all though. I ate these as a child. Fond memories. 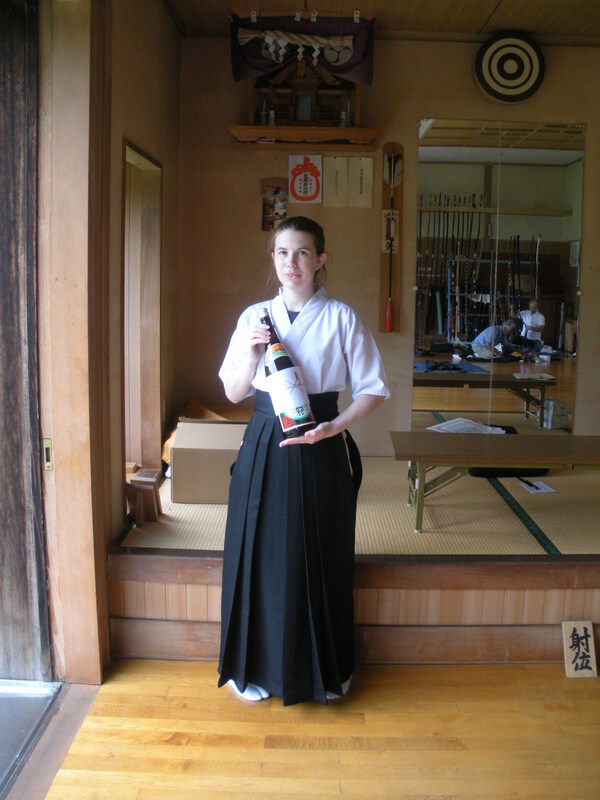 Salt Cultures are a traditional seasoning of Japan of the zymosis/fermentation of cultures and salt mixed with water. Miso, soy sauce, and table vinegar are also fermented the same way. Hijiki is truly delicious. 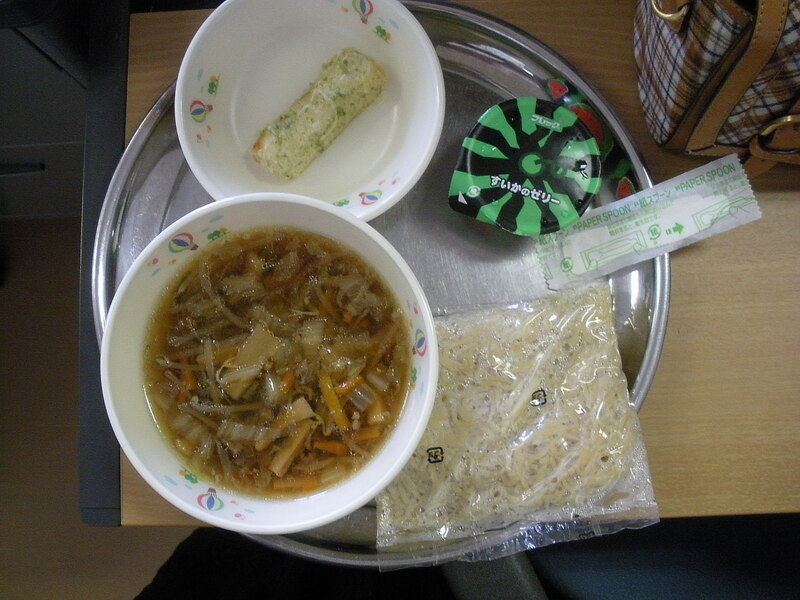 It is so wholesome and tasty, that I feel that liking hijiki is most probably a prerequisite for moral righteousness. It seems likely that there are those who disagree with me, but they must be in the wrong. Likewise, today’s fish and soup also had a pure deliciousness. After eating a lunch like this, one cannot help but feel good. Fried Isobe is when one wraps a food in laver (nori), coat it in a batter and fry it. Or it is dish whose is coated in a batter mixed with minced nori and fried. Today’s “suika no zerii” I translated as “watermelon jelly”, but the word jelly hardly has a universal meaning. In the US, jelly refers to a fruit preserve or jam that is solidified with pectin. But in the UK, jelly refers to a gelatin desert, similar to what we ate today, that is solidified with gelatin. In the US, such a dessert is generally called jello, after the brand name of a company which makes such a desert. Now let me educate you on the evils of gelatin. Well, not really, but I feel here in Japan, where kanten–a gelatin made from agar seaweed with a long history of use in Japanese cooking–is plentiful, it is better to use that than an animal product. As a child, my best friend didn’t like jellies at all due to their texture. But as for myself, since my favourite scientist Rodney Mckay is known to adore blue jello, so I must like it as well. The US or the UK variety, eaten with a spoon.